Role: Design Lead, Content Strategist, Primary Researcher. Our previous design of SearchTempest had given us over 5 years of great service. But with the need for structural changes growing over the years, along with the demand for a mobile-accessible interface, it was time for a responsive redesign. After completing our design research phase, three big goals came to the forefront: improving how we communicate with users, rethinking our city selection, and having an interface that reflects the enjoyment people get from our product. 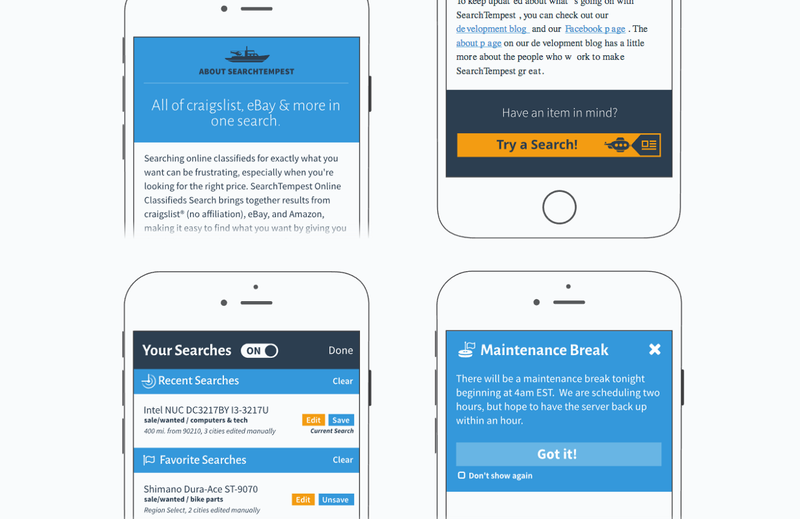 SearchTempest helps you discover the rare and best-priced by bringing together all of craigslist, eBay, and more in one search. With over 2 million users, it is by far the biggest player in its market. Excerpt from our Content Strategy. Read more of it here! Our previous interface was cluttered with both interface elements and pieces of copy that often left users confused or missing key details. Some of the restrictions of aggregating multiple sources means our search had certain limitations. Our previous designs had always tried to convey these with notices. Unfortunately, not only were these notices clogging up the interface, they also weren’t getting the point across. During user interviews, people often expressed great relief when I explained these limitations directly, so clearly they were helpful and necessary. For the redesign, we needed a clear strategy for presenting copy that was succinct, actionable, and contextually appropriate. 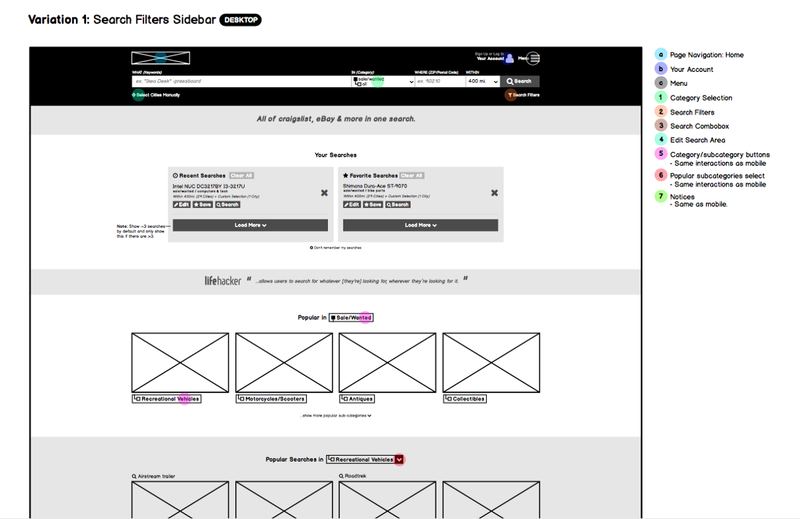 This strategy came in two parts: interface patterns and content strategy. We started with an exhaustive survey of all our content, who needed it, and what they could do with it. We noticed themes in these bits of content, and settled on a few types of notices that we designed patterns for. In our content strategy, we made it clear that these notices would give the minimum information necessary to convey what they needed to know and what their options were. All other information could be linked to in a more in-depth help article. We wrote a few messaging examples for designers and developers to use as templates for future notices. 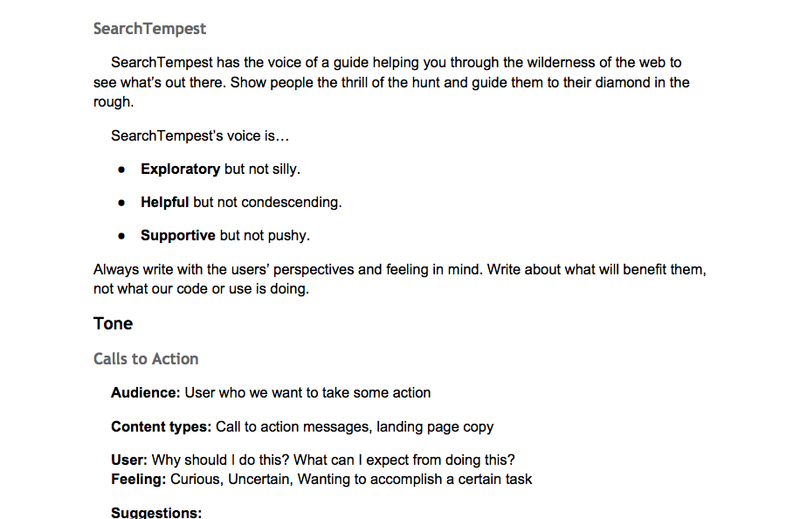 The content strategy also included style, voice, and tone guides to keep a consistent voice across the interface. Glossaries of terms specific to Tempest products helped create a shared vocabulary. Audience messaging explained our target audiences, their needs, and the messaging speaks to them best. SEO, usability, and accessibility best practices ensure we make content that works for everyone. I’m in love with cities I’ve never been to. A consistent concern of our users was the difficulty of customize the cities you were searching. In previous versions of SearchTempest, the cities we included in our results were any cities within a user-set radius from their Zip code. As we talked with users though, it became clear that this sort of city selection didn’t work for everyone. Often the closest cities weren’t the easiest to get to, especially for people on the coasts. Many people liked to check out sales while travelling, and were more interested in cities along a highway corridor than in a distance from any single point. It was clear we had to rethink or method for selecting cities. We initially considered visual ways we could achieve this, by drag selecting cities on a map, but eventually ruled that out due to the complexity involved. We knew that for simplicity we needed to have a default that required minimal user input, so we decided on picking a radius from a users location, either location services or entering a Zip. To customize their cities, we added an advanced menu where users could select individual cities and regions but prioritizing nearby cities to make the selection process. This maintained the ease of searching with minimal input while also providing customization for users with more tailored needs. One of the most delightful things to see from our research was the genuine enjoyment people had hunting for unique sales. The thrill of treasure hunting was very real. This got us thinking: what if we brought some of this excitement into the product itself? We started playing around with illustrations and concepts we could incorporate into our interfaces and copy. Initially thinking of traditional pirates and treasure maps, we found that more modern submarines, ships, and radar fit with our aesthetic better. They were playful without becoming silly, and still conveyed reliability. These illustrations were incorporated into our style tiles with multiple variations and examples that we could utilize throughout the design. Since this redesign is still on-going, we don’t have any specific results from it. However, the consistency brought by our design assets has made decisions quicker and easier to make, and we’re very excited to get it in front of users soon!